Garage: Single, Attached "16' x 50'"
The Foam Lake area has become widely sought after for Grain Farming and this 3 quarter package with very nice yard site is an opportunity to get your foot in the door! 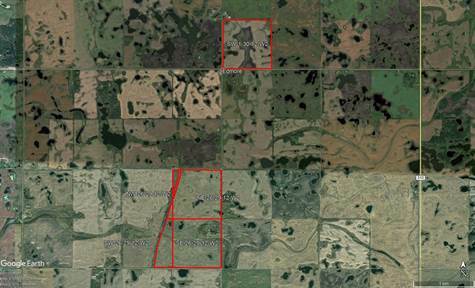 The land is comprised of an Oxbow Loam topsoil which is well known for producing grains including Canola, Wheat, Barley, Oats, Flax, Field Peas and more. The yard site includes a 1346 sq. ft. bungalow with attached 800 sq. ft. garage, 48’ x 72’ machine shed, 3 Metal Industries grain bins, miscellaneous wooden outbuildings, power service, natural gas service, well, mature shelterbelt, extensive flower garden areas, and access via a good grid road only 8.5 miles South from the Town of Foam Lake. SAMA Reports show 442 CA (cultivated acres). Seller advises approximately 420 CA in recent years. Land = $600,000.00 = 1.14 x Assessment = $1357/SAMA Cultivated Acre = $1429/Seller CA. House: New in 1973, approximately 1346 sq. ft. with attached 800 sq. ft. garage. Exterior: Painted Siding, Wood Soffit & Fascia, Asphalt Shingles. - Attached Garage 16’ x 50’, Cement Floor. - Kitchen, Parkay Wood Flooring, Painted Maple Cabinets, Fridge, Natural Gas Stove. - Dining Room, Parkay Wood Flooring. - Living Room, Parkay Wood Flooring. - Master Bedroom, Linoleum Flooring, Closet, Ensuite with Sink/Vanity & Toilet. - Bedroom, Linoleum Flooring, Closet. - Bathroom, Linoleum Flooring, Tub/Shower, Sink/Vanity, Toilet. Basement: Access from entry by garage. - Bathroom, Linoleum Flooring, Shower, Sink/Vanity, Toilet. - Rec Room, Linoleum Flooring. - Utility Room, Natural Gas Energy Efficient Forced Air Furnace, Natural Gas Water Heater, 100 Amp Main Electrical Panel, Water Softener, Water Pressure Tank for Well. - Storage Room, 2 Deep Freeze, Shelving. Septic Service: Lagoon located North of the House. Water Service: Big Bore Well, Fiberglass Cribbing, Submersible Pump, located West of the House. 48’ x 72’ Slant Wall Machine Shed, Metal Frame and Exterior, 2 x 12’ Sliding Door, Cement Foundation, Gravel/Dirt Floor, Power. 3 x 3200 Bushel Metals Industries Grain Bins, Cement Floors with Aeration inserts, 60 Amp Electrical Panel. 24’ x 30’ Wood Storage Shed. Water Hydrant and 1 Water Bowl. Garden, Lawn, and extensive Flower Garden areas. Services: Natural Gas, Power, Well, Telephone.